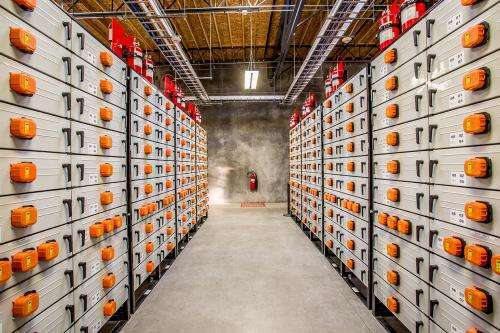 Portland General Electric's 5-megawatt, lithium-ion energy storage system was shared with the public today at the utility's Salem Smart Power Center in South Salem, Ore. The energy storage facility is part of PGE's contribution to the Battelle-led Pacific Northwest Smart Grid Demonstration Project. Half of PGE's $23-million portion of the regional project was paid for with U.S. Department of Energy funds. The regional demonstration is a five-year, $178-million project that launched in 2010. "The Pacific Northwest Smart Grid Demonstration Project is a successful public-private partnership involving 17 organizations across five Northwest states," said Patricia Hoffman, assistant secretary for DOE's Office of Electricity Delivery and Energy Reliability, which oversees regional smart grid demonstration projects. "It is a highly innovative project demonstrating transactive energy management, which is a promising, cost-effective way to integrate variable renewable energy, energy storage and demand response at scale. The celebration of the Salem Smart Power Center makes it clear that Oregon is helping to lead the way on energy storage commercialization and grid modernization." Hoffman was a featured speaker at today's ceremony, as was Ron Melton, who directs the regional demonstration project for Battelle. The battery is part of a highly reliable, localized power zone called a microgrid that will enable about 500 southeast Salem customers to tap into a power reserve during electricity disruptions such as blackouts. The battery and microgrid are examples of the innovative technologies and methods being tested through the Pacific Northwest Smart Grid Demonstration Project. The energy storage system will respond to regional grid conditions with the help of a key aspect of the demonstration called transactive control. Transactive control is based on technology from DOE's Pacific Northwest National Laboratory, which is managed by Battelle. The technology helps power producers and users decide how much of the area's power will be consumed, when and where. This is done when producers and users automatically respond to signals representing future power costs and planned energy consumption. The cost signals originate at Battelle's Electricity Infrastructure Operations Center in Richland, Wash. They are updated every five minutes and sent to the project's participating utilities, including PGE. The automated signals allow project participants to make local decisions on how their piece of the smart grid project can support local and regional grid needs. Participants are now gathering data to measure how the signal can help deliver electricity more effectively, help better integrate wind power onto the power grid and more. The Salem battery will use the signal to coordinate its charge and discharge cycles with the power grid's supply and demand. "Two-way information exchange in the Pacific Northwest Smart Grid Demonstration Project allows grid operators to make the existing electric grid more efficient, while also exploring how using other technologies such as PGE's energy storage system, smart appliances and wind power can bolster the reliability of our system," said Carl Imhoff, who manages Battelle's Electricity Infrastructure Market Sector in Richland. As an investor-owned utility that serves about 830,000 customers in 52 Oregon cities, PGE is testing several smart-grid technologies in the Salem area for the demonstration project. Beyond the energy storage system unveiled today, PGE is working to integrate renewable power sources to the power grid. It is also implementing a demand-response program with residential and commercial customers to help meet peak demand. All these resources will be optimized with the automated transactive control signal. "Together with our project partners and customers, we are demonstrating smart grid technologies to help Oregon and the nation learn how to build intelligent energy resources for the future while continuing to deliver long-term value for customers," said Jim Piro, PGE president and CEO. "We are proud of the collaboration, hard work and ingenuity that went into this project, and thank our Salem customers who volunteered to participate in this important study." As a primary partner in the project, the Bonneville Power Administration is leading the development of a regional business case for investing in smart grid infrastructure and technologies. "New, smarter technologies can help us make the most of the region's renewable resources, improve how we operate the power system and bolster its resilience," said Elliot Mainzer, BPA's deputy administrator. "We're looking closely at the benefits and economics so we can tell Northwest electric utilities and ratepayers which 'smart' investments will provide long-term value." BPA is working to support utilities in the project as they unite to address both regional and utility requirements. Communication and collaboration between utilities is key to making this all work, especially considering that five states are involved, with everything from large investor-owned utilities to smaller publicly-owned utilities. They have varying goals, but are working together to enhance the economics, reliability and integration of renewables for the power system. BPA has taken a lead role in assuring that the utility perspective is addressed as well as the regional perspective so the needs of electricity consumers throughout the Northwest are met. The Pacific Northwest Smart Grid Demonstration Project was co-funded by the American Recovery and Reinvestment Act through DOE, as well as the project's utility and vendor partners. Milton-Freewater City Light & Power—Milton-Freewater, Ore.
Peninsula Light Company—Gig Harbor, Wash.
University of Washington/Seattle City Light—Seattle, Wash. The demonstration project also involves a diverse team of technology providers, including Alstom Grid, IBM/Netezza, 3TIER Inc. and Quality Logic Inc. Washington State University and Central Washington University are also directly involved. More information: Click here for more information from PGE about the Salem Smart Power Center. Is this the peak power delivery or should it read "MWh (megawatt hours)" for energy storage capacity?